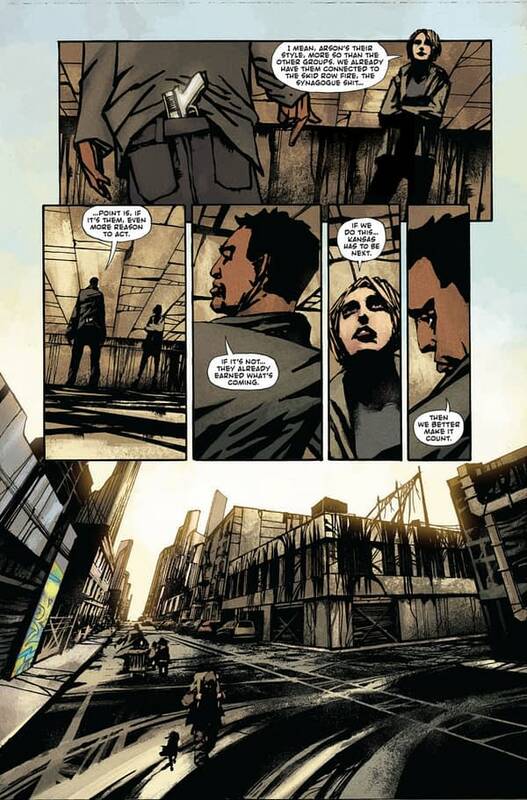 Days of Hate is Ales Kot‘s new 12-issue series set in a near-future America that’s been balkanized into a fascist state. It features a pair of former lovers who have ended up on opposite sides: one now working for the government and investigating the other, who has joined the guerilla movement against the state. And the resistance is about killing white supremacists. 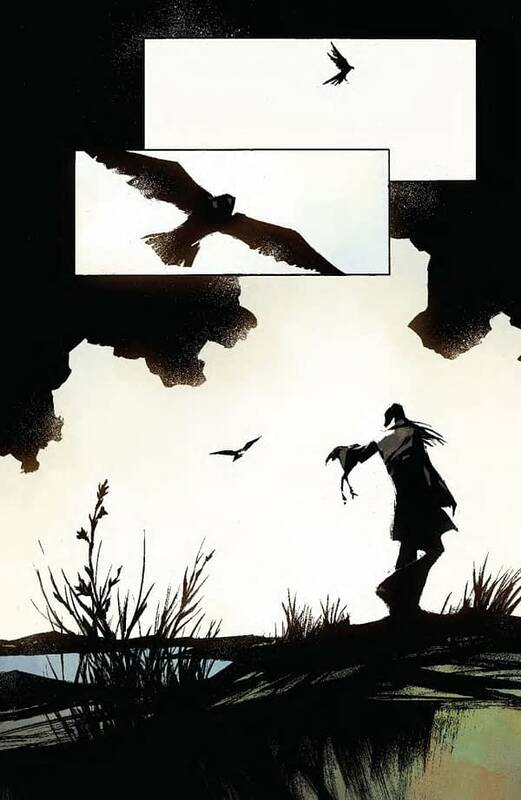 With Daniel Zezelj‘s high-contrast, moody artwork and Jordie Bellaire‘s atmospheric colours, the series is probably Kot’s most visually stylish story to date. It’s as immediate in its reaction to the current mood in America as his books ever are, I had a chat with Kot last week about this — and his going off to live in the woods. Adi Tantimedh: Ales, I was a bit out of the loop at the time, but did you go off to live in the woods for a bit? Was it to get away from it all and think for a bit? Ales Kot: Yeah, I did. Felt like the right time. I realized I needed the time and space to process the past few years, which were quite rough, and simultaneously also needed the space to be away from the daily sociopathic rhythms of the media and be within enough emptiness to work on a few new projects. I like the woods and the mountains for that; life is simple here. Make fire, take care of food and water, do my thing. If I want to get in touch with someone, I do. If I don’t, that’s that. AT: So what did you take from that break in the woods? Did it put things into some kind of perspective? AK: I’m still in the woods, still processing. I figured out something really nice and important yesterday, so I exhaled and smiled and rested my head against the wall. The experience is definitely putting things into a healthier perspective, because I’m here alone, so I have to face myself, you know? And honestly, I love doing that. I’m not afraid of that. And if I feel afraid, I believe the best thing to do is usually (not always, of course, but if we’re talking the internal…) face it, work with it, learn from it, transform / integrate it. There’s a lot of that going on for me. It’s been over five years since I began writing professionally; it’s been a really eventful time for me, and I feel like, in a sense, I just began, which feels like a good sign. AT: Did the thinking and processing inform Days of Hate? I assumed you already planned it long before you left for the woods. AK: I was done writing the first four-or-so chapters by the time I got to the mountains, and I had a good idea of where the entire story was going already, so not in that sense. But as with anything that’s still being processed, changes do come, and more so when you’re alone in the mountains. Everything inside you knocks on your doorstep and asks you how you are. Sometimes the guests are new, other times they changed. It’s a party out here. 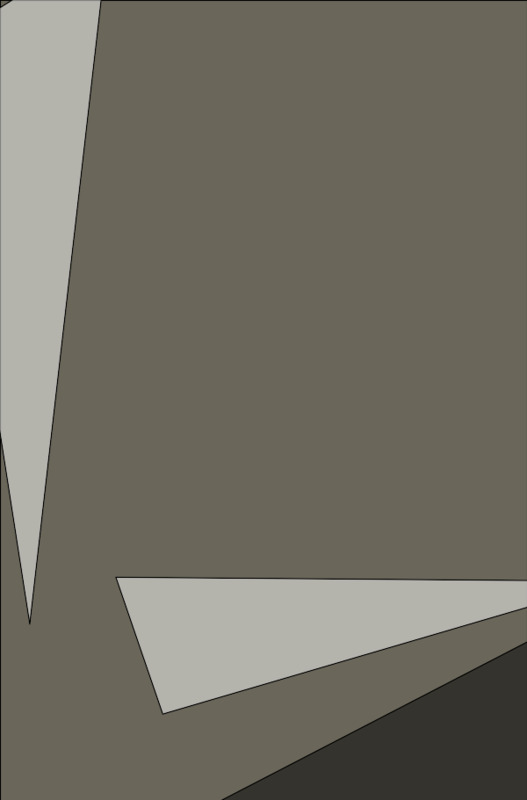 Realizations that came while here so far in regards to Days of Hate, at least the ones I can either discuss directly or imply their shapes: chapter five received a very rigid panel layout because I realized just how much a specific rhythm mattered there. It’s almost entirely told in three panels per page — the sole exception being page one. I revised the narrative of the second arc, tightened it up, and let certain characters have more specific and specified character arcs. This in turn furthers the story. My sense that Days of Hate is the second part of a “survivor trilogy” of sorts, or alternately a “violence trilogy” or a “war trilogy” — that came up for me, or at least that’s how I choose to think about it now in relation to Zero and also Eternal, my next big project. The longer I allow myself to think as a survivor of violence, the more my understanding of the world widens. The longer I remember that I am a part of systems perpetuating violence, the more my understanding of the world widens. The longer I remember that we are locked here together and have to find ways to process all that… of the many reasons why it made sense for me to spend time alone, these are some of the most important. AT: Days of Hate is very much about surviving a dark time and the moral decisions that have to be made in it. It feels like the darkest of your works, perhaps because it’s also the most naturalistic and grounded. It doesn’t seem to have any science-fiction tech or supernatural elements; just a down-and-dirty crime thriller. What made you decide to do a straight-up thriller this time? AK: I don’t know. It was never really a question — the story just started appearing this way, mostly through the characters. So I did my best to focus on what made it true to me and revised accordingly, as well, analyzing step by step in relation to… well, a lot of parts of this world. In some cases that meant changing things as I went along — an ex-partner and an acquaintance suggested I change the gender of one of the key characters, and after some contemplation I agreed it was the right move, because even though they didn’t know the entire character’s and story and it would have worked both ways, the adjustment felt more interesting. It allowed me to explore a few processes I was already going through with a bit more internal freedom. Plus, representation matters. Then there were the key touchstones in other arts — Army of Shadows, Battle of Algiers, Come and See, Joe Sacco‘s comics, Jacques Tardi‘s comics, V For Vendetta, and more. My own experiences, and experiences of my family and people around it. Reading history books, researching dictatorships, revolutions, revolutionaries, dictators, the grey zones between them. I’m into rawness in my arts and in my life — I want that, and I want depth. I’m into exploring what fascinated me my whole life. I wanted something with a fair bit of a documentary feel to it, a world that feels lived in. Danijel’s art does a lot of the heavy lifting on that front, as well. AT: Did the more episodic, procedural structure of the story also come out of that thinking? AK: I guess? I never really thought of it as either, but… I wanted to give access to a continuous stream, you know? AT: I think there’s a subtle difference between a cliffhanger and the point where a story simply takes a pause. 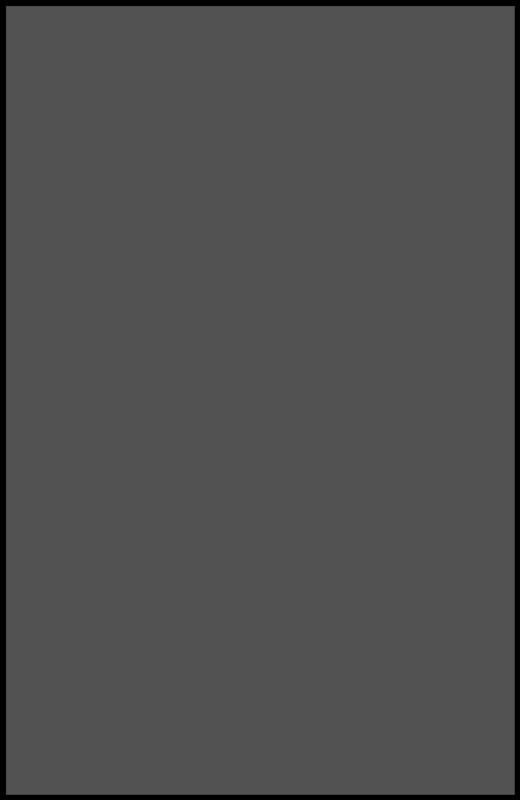 For the latter, the author chooses a minor end for one aspect of the story to allow the reader to gather their thoughts before taking the story forward. A cliffhanger is a plot-driven point where something urgent with high stakes begins to happen, and the story stops rather than ends, and the reader is left hanging. The objective is to hook the reader into wanting to know what happens next with a greater sense of urgency than just a chapter break. Many of your other books end with cliffhangers, like the recent Generation Gone. 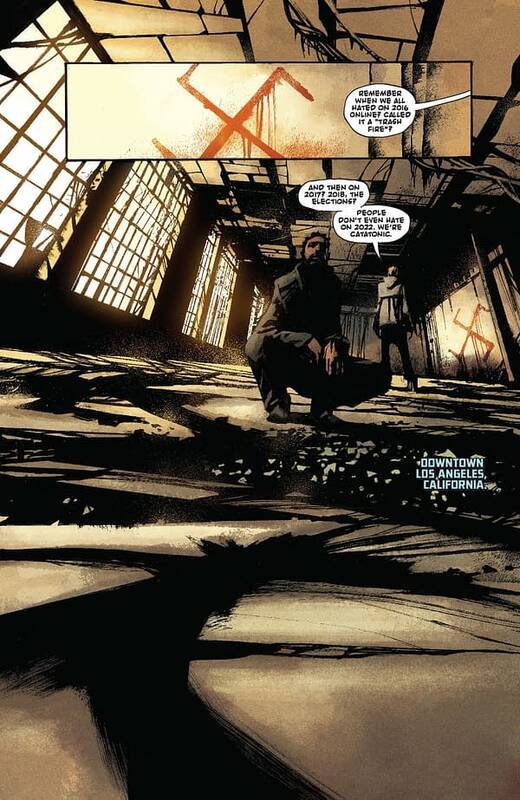 The first issue of Days of Hate ends at a pause — a character has finished doing something, which will drive the story forward in the next chapters or issues, rather than ending the issue on an unfinished action or plot point. This also makes it feel more like an episodic television model of narrative. AK: Ha, interesting that you read it that way. 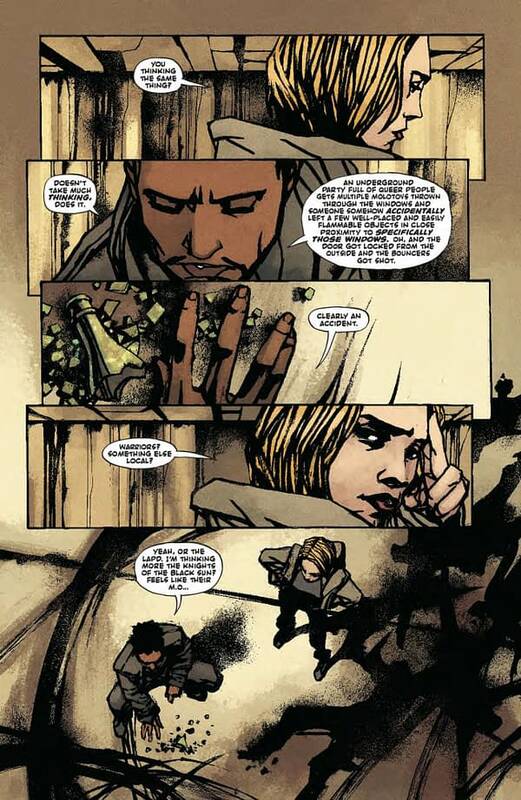 To me, what happens at the end of the first chapter of Days of Hate is both a cliffhanger and a chapter ending. I agree that I’m doubling down on characters, themes, and situations and not really formally experimenting — there’s some wonderful formal experimentation in Jordie Bellaire’s coloring preceding that moment, but nothing like that from anyone in the final couple pages or so. When I talk about continuous stream, it doubles as a Cassavetes reference. There’s a sentence in Love Streams, his last finished film — “Love is a stream. It’s continuous. It doesn’t stop.” — that I keep on my mind a lot. You could say it’s somewhat a guiding principle. I’ve never been able to stop loving anyone I ever loved, and I believe that a lot of love is communication, be it verbal or not, and I believe art is communication, and I’m learning to express each story fluidly, without taking you out of it, allowing you to sink deeper, deeper, deeper. AT: I’m not knocking “television-style” storytelling in comics at all. It’s just another style. I do feel that a lot of comics writing has been more and more influenced by television writing for the last 10 years, possibly longer. 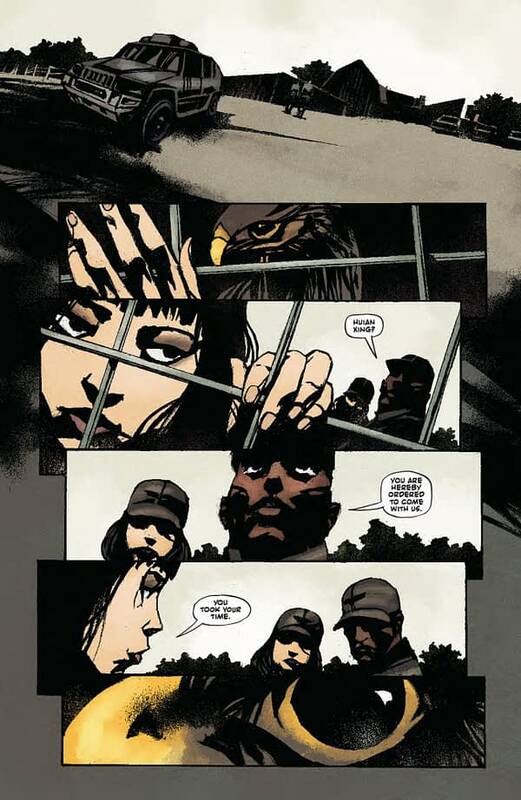 It’s a very clear, direct way of telling a story, and the decompressed style of storytelling in comics — letting moments of silence draw out longer to convey emotion and mood rather than just expositional dialogue — that’s become much more the norm in mainstream comics now. And I do take your point in going for a more natural (is that the right word?) flow in storytelling. 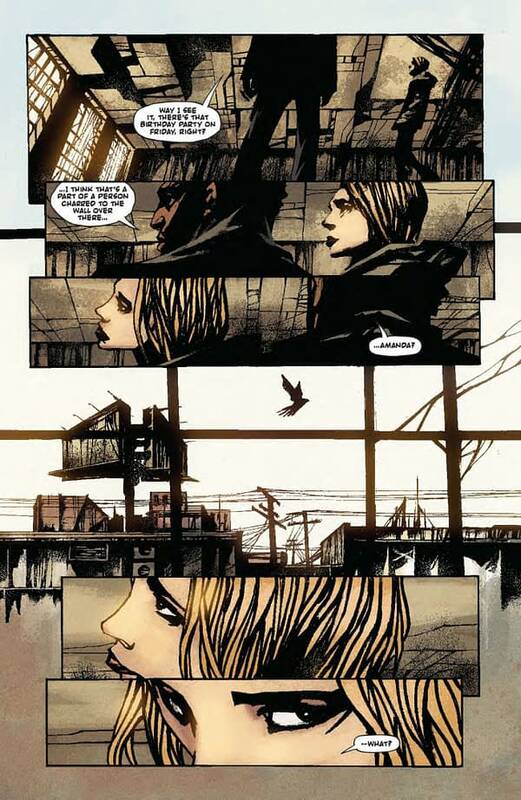 I do feel Days of Hate is the most cinematic of your books to date, especially with the experiments in colouring that Jordie Bellaire is trying to establish certain motifs of mood and theme. I guess what I’m trying to look at is how you’ve tweaked your storytelling style even further for Days of Hate. So let’s get to Days of Hate itself. Can you talk about what inspired it? If feels like you reacting even more directly to the sense of the balkanization of America, the anger and resentment brewing away that’s exploding in violence and the threatened rise of fascism. How much of it is informed by your perspective as someone who grew up in Eastern Europe? AK: Oh yeah, and to start from the beginning, I wouldn’t dare say that “television-style” storytelling is not affecting my approach to comics. Of course it is. If it will, and how, is something I usually mostly decide before I start writing, but I also often find other bits of approach within the work itself, so it’s an open process, a software with updates. I also just like silences, you know? I love Eastern storytelling, I’m influenced by taoism (I mean, my run on Winter Soldier is pretty clear about that) and buddhism, Andrei Tarkovsky is one of my all-time favorite directors, and… I mean, yeah, I’m spending months in a mountain cottage by myself. I love silence. And I love giving an artist space to explore, to give the story their best, too — and that can’t happen if you overcrowd the story with words. I’ve gone the other way and made some very text-heavy books — I think Change and The Surface are in particular like that and were able to succeed artistically because we knew that was what we were doing — and I’ve made nearly silent issues, like chapters 13 and 14 of Zero, that worked for the same reason. And I really dislike obvious exposition, so I try to do away with that and let the important things come out naturally, be it via dialogue, the narration, the visual, or some combination of them. One of the other things that I really focused on, and want to continue being focused on from now on, is making everything flow from the characters. HBO has the “story matters here” slogan, and I was thinking about that recently — how for me, every day I work, even when interacting with finding images, or scenes, or wanting to talk about specific idea or otherwise explore it — I want it to be rooted in character, so “character matters here” first and foremost. I can make everything else flow from that. I can still find poetry in every panel, or in every frame. I think that understanding comes from growing as an artist, and becoming a bit more secure in my craft. And then I start working on the next project and it challenges me yet again. Learning never stops. AK, cont’d: Oh gods, that second question; that is a lot. Everyone asks that, and I totally get why. I grew up more right in the center of Europe — if you look at where Czech Republic is, it’s this space right between Germany and Poland, with most of the big European highways going straight through or almost straight through it. But the thing with being the center of Europe is [that] you get to see the clash between East and West in such detail. I experienced an almost entirely non-violent revolution in 1989 — I was three years old. Some of my first memories are of that time. I experienced the state being cut in half and renamed. I experienced running away to Germany with my parents and being sent back. I experienced and observed, first unconsciously and then with more focus, how different generations cope with changes of systems. How some people employ selective memory to make the past more palatable. How others vanish. How others yet benefit. How people lose their ability to speak, first in complete sentences and then even their interiority. How the censorship and the snitches and the underground trade work and then change with the onset of free-market capitalism. How other countries navigate the changing playing field. How teachers don’t know how to teach in a world that is no longer a totalitarian one, how people forget they can speak freely and try to teach another generation to fear the power of their words and dreams. All in a country whose first elected president after the Soviets left was a playwright and dissident who spent years in prison peacefully pushing against the occupation. It absolutely influenced me. AK, cont’d: What also influenced me: growing up around the desolate bunkers and tanks of WWII embedded within the landscape. Walking into barbed wire in the woods. Touching bullet holes in Croatia a couple years after the war passed through. Not being able to walk in certain directions because “there’s still landmines there.” Realizing some families can carry their war wounds for a very long time. Discovering a likely hidden mass grave. Reading about wars and various types of dictatorships and the resistance since I was a little kid. Reading diaries written by one of the patients who survived the experimental ward in Auschwitz as a maybe 9-year-old and realizing humans are capable of any evil on Earth, which liberated me because it stripped me of any illusions about our innate goodness or badness. Hearing “I am just following orders,” in its many variations throughout my life and never not hating it with a power so dark and dense it would twist my face. Seeing a lot of this at play in the USA for the past decades, steadily growing in size. Seeing people avoid the conclusions. Seeing people avoid the comparisons. Yeah, it’s definitely built on something real. AT: Let’s talk about how you decided on the setting, then which characters you felt best fit the story you wanted to tell for Days of Hate. 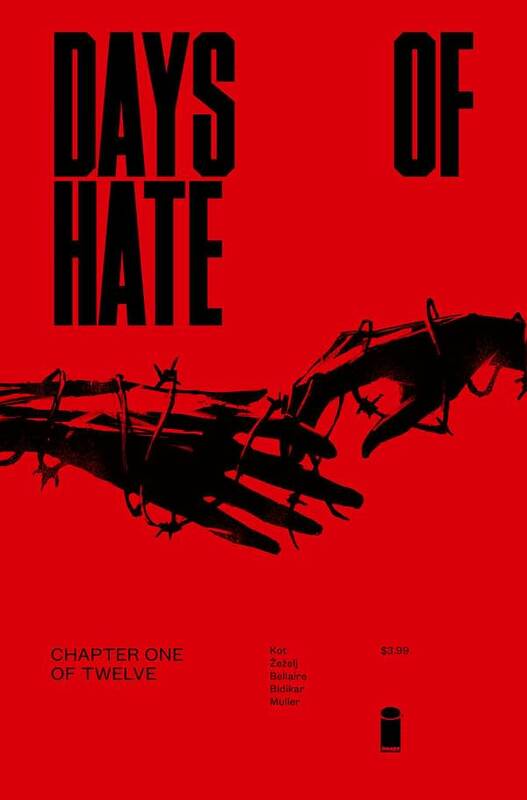 Days of Hate is out in stores on January 17th, 2018. Will Your Comics Be Delayed This Christmas and New Year?